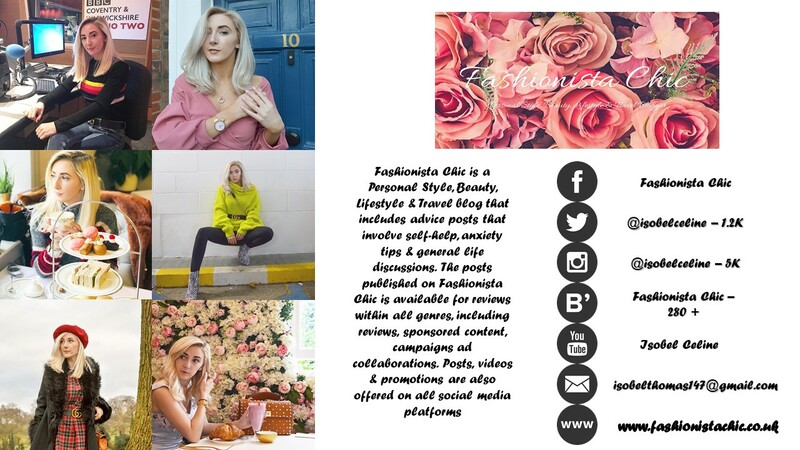 I'm a UK based Personal Style, Beauty, Lifestyle & Travel Blogger. This blog was firstly created to show what bargains I had bought from local charity shops, car boots or online etc. I'm a serious bargain hunter...I find things so cheap - and so will you if you shop in the right places! Sometimes I spend a lot of money on one thing, but that's only if I seriously am wanting that item and feel the need to splurge on myself every now and again! Even though I started this blog back in 2014, a lot has changed, from moving onto expressing my personal style, beauty favourites or reviews to even advice posts where I explain about certain topics on judgement, anxiety and many other things. I also write about certain aspects of my lifestyle, especially on my YouTube channel too in my weekend vlogs. If you love all these sort of things as well as added humor, then your on the right blog! I'm a big lover of art as I am visually inspired by everyday life. My artistic flare is reflected in my love for fashion, which explains my unique style. I get inspiration from other bloggers writing, people I see in the street, mannequins, pinterest etc. But, I try to inspire myself and create my own outfits in ways that I feel are right for me. I also write about recent beauty purchases I've bought and leave my honest opinion of what I think of them. I am no expert, I am just self taught on the beauty side of life. As for my passion for music, I may not seem like a rock music lover but I seriously am! I love all types of music, even from the 1970's - a lot of my favourites come from that era, which shows in my love for the seventies fashion within my style. When it comes to the photography on my blog & social media platforms, I mainly use my Nikon DSLR D3200, FujiFilm X-A20 or my iPhone 7 Plus Camera. If other people feel inspired by what I write or post on my blog then that's a bonus! I also love to help people by giving them advice in ways that will help them to improve as a person and will love themselves better. Everyone is unique in their own special way and have their own style, personality, likes and dislikes etc. But they just need to find out who they are and love who they are, not try and be someone they're not. Be true to yourself and be the best version of yourself you can be! Last but not least is the motto I go by - 'Whatever you do, do it in style' - Very (www.very.co.uk) I also heard a recent one from a Blogger (Sarah Ashcroft) "Life's too short to be little."